You So Good. Miso Good. This is my favorite, new salad dressing. It is colorful, complex and exploding with flavor. It gussies up the simple lettuce leaf or the hearty grain, turning anything it touches to gold. Really, it does. It tastes like the dressing you get on that little starter salad at a Japanese restaurant except it’s one thousand times better. One thousand! That’s a whole lot better. This recipe is a whiz of fresh ingredients – carrots, shallot, ginger. I’d never made a dressing with miso before and I think it lends a balance that is often lacking in others. Balance is always good. I tend to sway on the extreme vinegar side of the dial. I’ve been known to have a bottle of balsamic on my office desk to drizzle on almost anything savory at my leisure. I ran out a couple of months ago and now Tapatio stands in balsamic’s place, acidic and brown replaced with spicy and red. 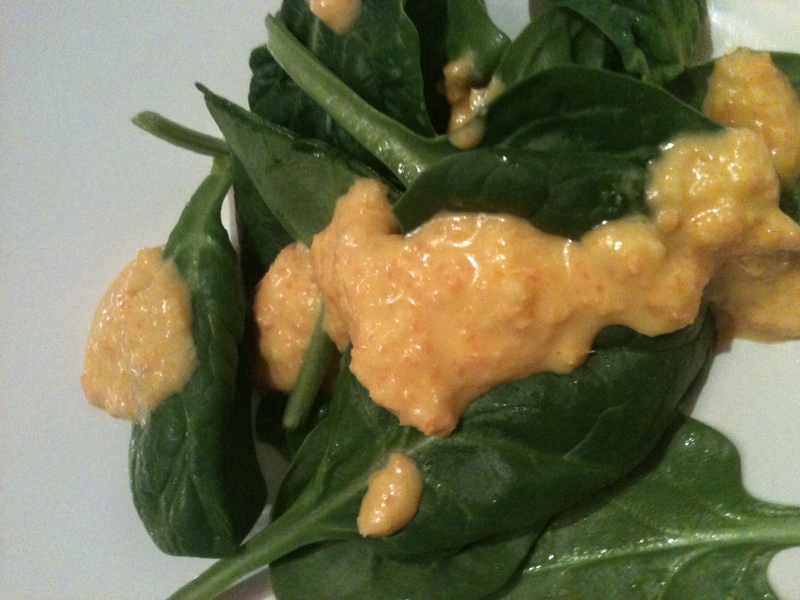 I first read about this dressing on Smitten Kitchen, who got it from Gwyneth at GOOP. I could drink it straight, but it’s even better with food. SK recommends it with a simple butter lettuce and avocado salad. I first tried it with mixed greens, brown rice and avocado for a heartier, lunchtime affair. I want to try it with poached fish or chicken. You should try it with whatever you want. On ice cream. I dare you. Could be a hot, new artisanal flavor – Tahitian Vanilla with Golden Miso Swirl. Maybe not. 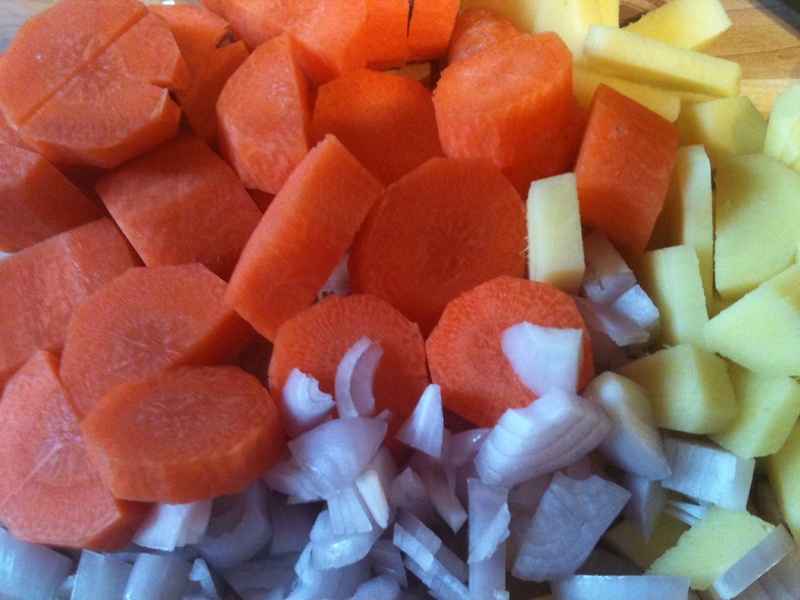 Whiz the carrots, shallot and ginger in a blender or food processor until finely chopped. Scrape down the sides, then add the miso, vinegar and sesame oil. While the machine running, slowly drizzle in the grapeseed oil and the water. Drizzle anything you desire with plenty of dressing and serve. Thank you for this recipe! I always love this dressing in Japanese restaurants so was so excited to try this. I made it last night and it was yummy! One suggestion: I’d recommend starting with less of the solid ingredients, adding a bit of everything, tasting, then adding more. The shallots, ginger, and sesame oil in particular can overwhelm if you add too much initially (then you have to make a heck of a lot more dressing to bring everything back in balance). I found I needed to use a little more liquid than the recipe called for too. But I imagine it is partially to taste and partially based on the size of the carrot/shallot and amount of ginger. P.S. I used it on chopped kale and avocado. Amazing combo! So glad you liked the dressing, Danielle! Thanks for the tips. It is a little thicker than most dressings, so adjusting the liquid ingredients is a good idea. Cheers!